Today's cars do everything from heating your seat to driving themselves. It's easy to forget that automobiles started out as rickety, steam-powered carriages. How did we get to climate-controlled, computer-controlled, airbag-equipped modern vehicles? We have engineers, scientists, designers and more to thank for that. In honor of National Inventors' Day on February 11, we looked at five American inventions that helped make the car what it is today. The early 1830s saw America in the grip of "rubber fever," but things got a little too hot-literally-when customers found that their new shoes, bags and more melted in the summer. Hardware merchant Charles Goodyear, however, was undeterred by the boom, bust and his own bankruptcy. He spent years trying to figure out how to stabilize rubber, even continuing his experiments while in debtors' prison. In 1839, after testing nitric acid, lime, and turpentine, Goodyear added sulfur to rubber on a stove at a factory in Woburn, Mass. Instead of melting, the mixture actually hardened. He patented the process, later dubbed vulcanization, and vulcanized rubber is used in tires, transmission belts, seals and more. When the rubber meets the road, it's a smooth ride thanks to the development of commercial asphalt by Edward De Smedt in 1870. A chemist from Belgium, De Smedt had seen early paved roads in Paris that used asphalt mined in Switzerland. The material was mixed with pebbles or crushed stone to form a durable surface. De Smedt was so intrigued that when he came to New York in 1861, he began experimenting with coal dust and sand as pavement materials at Columbia University. He hoped to find a substance that worked better than the Swiss asphalt and was just as cheap. He patented a "sheet asphalt pavement" using a sand mixture in 1870, but the first stretch, in Newark, N.J., didn't last. Luckily, De Smedt continued to refine the mixture, eventually paving roads in New York City and Washington, D.C. The first enthusiastic asphalt users were cyclists, but they soon had to share the pavement with eager drivers. Henry Ford is usually credited with the invention of the assembly line in 1913. 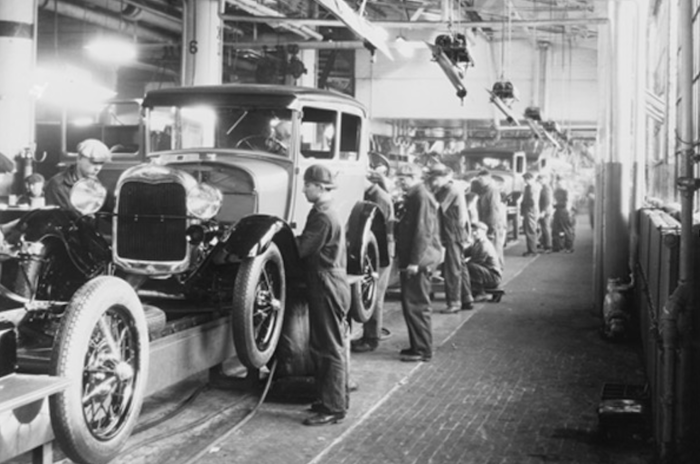 But technically, the first assembly line was developed in 1901 by Ransom E. Olds, founder of Oldsmobile. The first cars stayed in one place during production; workers walked to them. Olds sped this up by putting the cars on stands with wheels, so they could be brought to the workers. While other automakers struggled to produce, his factory in Lansing, Mich., used this "progressive assembly" to turn out 20 cars a day, and soon, his Curved Dash Oldsmobile was the most popular car in America. But Ford deserves some credit. He eventually caught up to Oldsmobile's numbers, and, with his production manager, developed a steam-powered conveyor belt that carried parts past workers at the Highland Park, Mich., plant, creating the moving assembly line model that's still used today. On early cars, windshields were an afterthought. Americans were used to driving buggies, so they didn't mind being out in the elements. There was also the problem of being able to see through the windshields, as Mary Anderson found when she traveled to New York City in 1902. The city's enclosed streetcars protected riders from the weather. When it snowed or rained, however, the drivers had to open the windows and stick their heads out to see where they were going, a maneuver that slowed traffic and distracted them from their driving. Back home in Alabama, Anderson drew up plans for a squeegee mounted on a windshield-wiping blade, controlled by a lever inside the car. She patented her design in 1903, and in the 1910s, as cars sold by the thousands, the windshield wiper became optional on new models. Not only did Anderson's invention make driving safer, it made today's completely enclosed, comfortably climate-controlled vehicles possible. Oil refineries had been making gasoline since the mid-1800s, but the process was inefficient and slow-the real goal was to make kerosene. With the invention of gasoline-powered internal combustion engines in the late 1800s, though, there was suddenly a demand for gasoline. Oil companies needed a way to produce it faster. Two chemical engineers at Standard Oil's Whiting lab in Indiana began experimenting. First, William Burton and Robert Humphreys added chemicals to the crude oil, then tried heating it. Finally, in 1913, they came up with the idea to apply both heat and pressure-and it worked. "Thermal cracking," as the method became known, doubled the amount of gasoline that could be produced from a given volume of oil and helped make it widely available. Cars have come a long way since the first gas-powered vehicles. See where they're headed in our The Future of Car Safety story.